When I want to eat quickly I usually fall back on my go-to’s for quick cooking: pasta or stir-fry. In the time it takes to boil pasta or make rice, you can usually finish the chopping and cooking you need to make a tasty meal. Bavette: somewhere between flank and skirt, at least according to Marin Sun Farms. 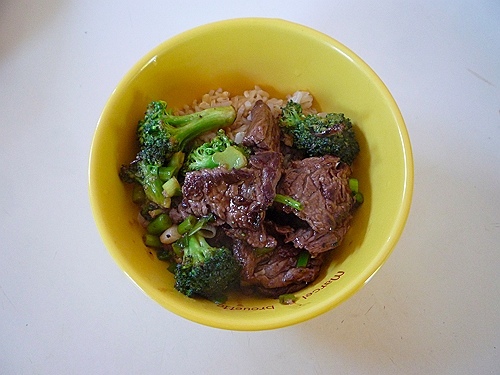 Start rice cooking in a rice cooker–if it is white rice, your rice and stir fry should be done at about the same time. 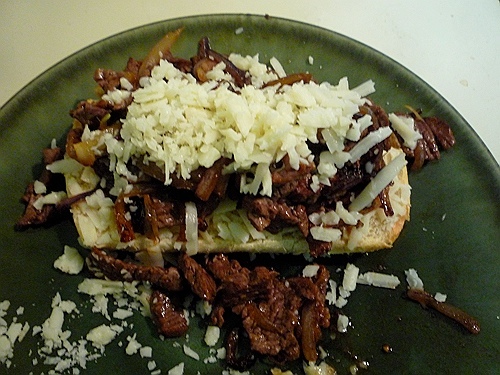 Chop beef into thin strips. If using a cut like flank steak, or other strongly grained cut (which have great flavor, and I highly recommend for this) make sure your strips are cut against the grain. 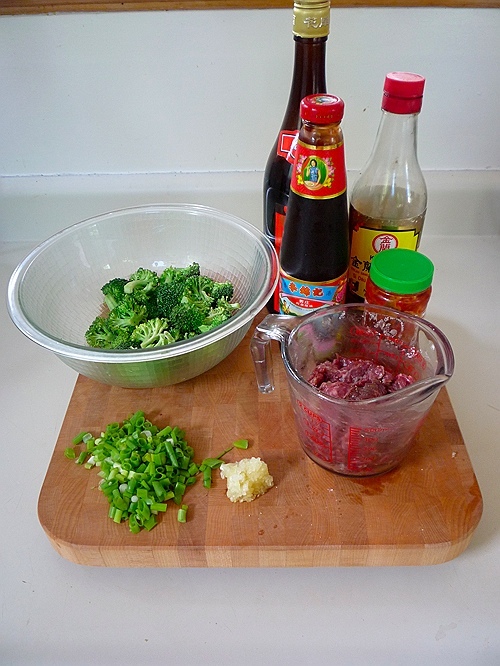 Add marinade ingredients to beef and mix. This marinade is fairly universal–the sesame oil is specific to this dish, but the cornstarch, (I’m 90% sure my unlabeled tub is actually tapioca starch, I’ve found most starches to be pretty interchangeable for this purpose.) dark soy, (you could use regular soy and the slightest pinch of sugar, preferably brown) and Shaoxing wine are universal. I occasionally add a bit of crushed garlic and ginger to the marinade. Wash broccoli, then chop into bite sized pieces. Place in large bowl and microwave for 1 minute. 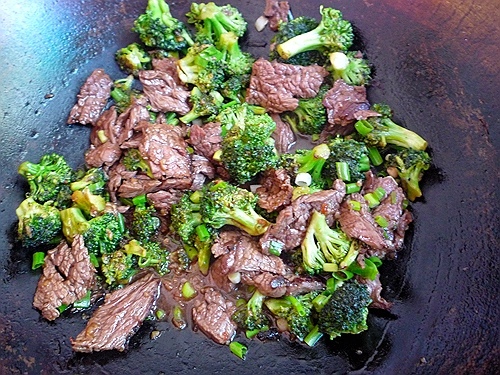 Seriously, this is the secret to stir-frying broccoli. If you’re one of those people who insist that microwaves ruin food go ahead and blanch them briefly, but know that you’re wasting your time, the energy of whatever heat source you’re using, and one of California’s most precious resources, water. And unless you can produce a blind taste test proving your point, I insist that the microwave is the way to go on this one, convenience and tastewise. Chop garlic and scallions and anything else you want to add. The acceptable additions include a bit of ginger, carrots or red peppers. Maybe mushrooms. Gather all ingredients and head over to the wok. Heat wok over high heat, add about a tablespoon of high smokepoint oil (I use grapeseed, but peanut is the most common) and when oil starts to shimmer add the beef. Though it is called stir-fry, I try to spread the meat out in a single layer and leave it alone for about a minute. 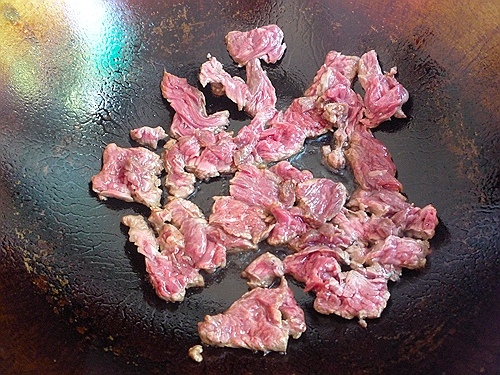 Then stir to your heart’s content, or occasionally until beef loses all pinkness, but not longer–remove to a bowl. 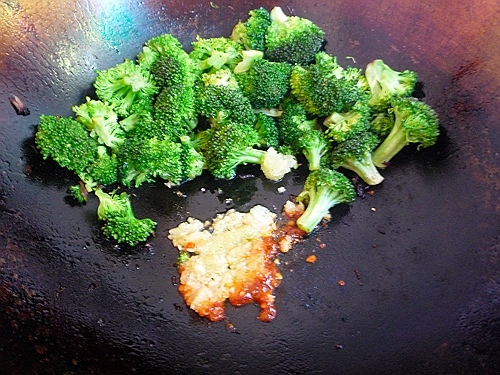 Add broccoli to wok, making sure to drain away from any water remaining from washing/microwaving. Stir-fry for at least a minute dry, then push to the side and add 1 tsp of oil and the garlic and optional chili-garlic paste. When garlic begins to turn golden, stir the broccoli in and continue stirring until broccoli is almost at the desired tenderness. I like it with a fair bit of crunch remaining. Watch out for the chili fumes. 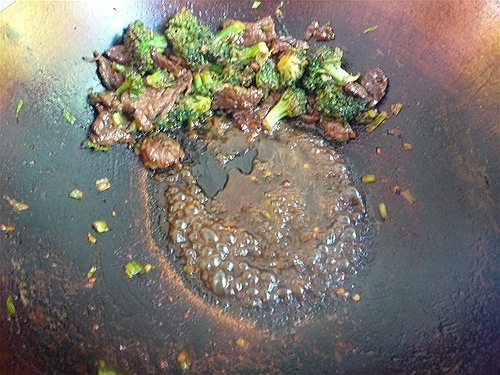 Add beef and any juices back to the wok, stir to combine. Add Shaoxing wine, oyster sauce, and soy sauce and stir. If sauce is still too liquid, push solid ingredients up the side of the wok and reduce the liquid to a proper sauce consistency. Unlike many recipes of this sort, I don’t add a lot of liquid ingredients plus constarch as I don’t like the final texture to be too gloopy. If your Shaoxing wine is the salted type, the final dish will be quite salty–you could add water or stock and cornstarch to add some gloop and reduce the saltiness, or just halve the Shaoxing and soy sauce. Of course, I don’t normally measure any of this stuff, just dump from bottles at the stove, but I did this time just to make sure my estimates weren’t way off. Reducing steams up my camera. And while this was one of my best beef with broccoli executions yet, largely due to the extremely flavorful beef, I was slightly disappointed that it didn’t taste quite as beefy as it did last night, when I made that beefy classic, a cheesesteak. The beefiest cheesesteak I've had in years.